About a year ago, I purchased a madeleine cavity pan on a whim, set it aside and forgot about it. For some reason, every recipe I looked at made it seem like madeleines are super difficult to make and easy to ruin. Fast forward to a few days ago, I found the pan while looking for something else and decided to just go ahead and try making madeleines. I surprisingly had a majority of the ingredients on hand which made the entire process that much easier! After about an hour of baking, I had perfect madeleines and they are seriously so delicious! 3. Don't overfill the cavities. The recipe I started off following said to spoon 1 tablespoon of the batter, but I think it was too much. The batter does spread while baking so don't focus on filling the entire cavity to the top. 4. 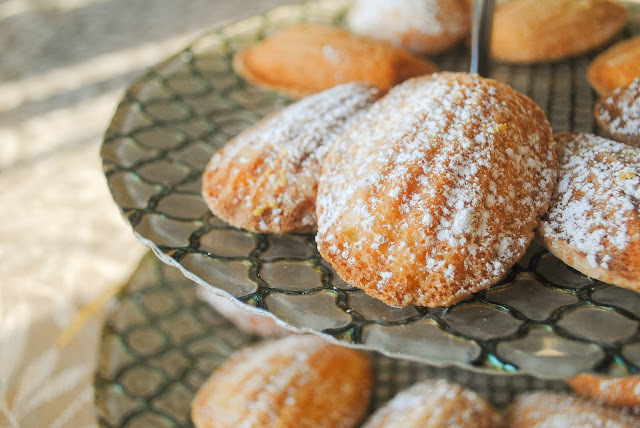 Allow the pan to cool before you remove the madeleines, and let them cool scallop side down. The back of the cookie will be soft and might stick to your cooling rack so it's better to let them cool on the hardened side. Use an electric mixer to beat the eggs and sugar in a large bowl until just combined. Beat in vanilla, lemon peel and pinch of salt. Add flour; beat just until blended. Slowly and steadily add the cooled melted butter, beating just until blended. Spoon enough batter to fill the middle of each cavity in the pan. Bake until puffed and edges are golden brown, about 12-16 minutes. Gently remove madeleines from pan using a silicone spatula. Repeat process, buttering and flouring pan before each batch. Madeleines are best eaten fresh, but can be made a day in advance!